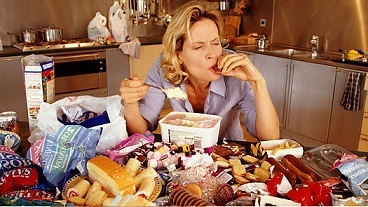 Emotional Eating- Recipe for Disaster? Emotional eating has derailed many well-intended diets and can make the weight loss process very frustrating. Disclaimer: I am not even an arm chair therapist, I am speaking solely from the perspective of over 10 years of experience working with people who try to change their nutritional habits.What is emotional eating? Emotional eating is turning to food for comfort, stress relief, or reward, rather than to satisfy hunger. Since emotional hunger can never be satisfied via calories, it is a losing proposition from the get-go. Diets are incredibly strenuous for the best of us; anyone who has an emotional relationship with food is almost guaranteed to fail. If you are eating for reasons outside of nutrient uptake you simply cannot diet without fixing the triggers of emotional eating. Once you identify your trigger, you can try and replace it with a different action such as reading when bored, lifting weights when anxious, meditating when stressed, etc. On the more practical side, start by cleaning up your environment, meaning removing comfort foods from your kitchen and modifying your shopping list accordingly. Do not let hunger build up, neither emotionally nor physically. Food is great and there is nothing nicer that a meal within your circle of friends and loved ones. But food does not provide happiness (neither does a great physique, by the way). If you think in those terms it will be impossible to overcome the dietary challenges brought by an emotional relationship with food. Happiness should be derived from friends, purpose, a certain autonomy, mastery toward what you are doing, and yes, sometimes a delicious meal. But food is only a rather small aspect of human life, so do not let it dominate your whole being! Previous post: METABOLIC DAMAGE FROM SEVERE DIETING – IS IT REAL? Next post: The power of grit and what it can do for you!